The items typically hearing people use on a daily basis may be difficult to use for someone who is deaf or hard of hearing -- particularly items that use sound as their main function. For example, smoke alarms save lives because of their loud sound that alerts people to fire and smoke. Someone who is deaf or hard of hearing may not benefit from a typical smoke alarm because they will not hear the alarm. There are smoke alarms available for the home with a strobe light so that it will get the attention of a deaf or hard of hearing person. Alarm clocks are the same. They function by using a loud sound to wake a person. Most hard of hearing people do not wear their hearing aids or cochlear implants to bed and may not hear an alarm clock. 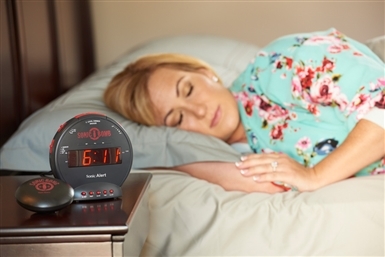 There are clocks available that use light, incredibly loud sound and can vibrate the bed to wake someone up! Even something as routine as using the phone can prove very challenging for a deaf or hard of hearing person. 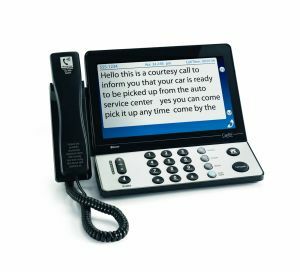 There are caption-call phones that transcribe what is being said over the phone and show the text on a screen on the phone. And, there are many smartphone apps available that will provide the same caption service as the landline phones. Discussion: What other typical daily activities do you think would be a challenge for a deaf or hard of hearing person? What can be done to accommodate those challenges? Did you know pro-football player Derrick Coleman (who now plays for the Atlanta Falcons) is deaf? Watch his inspirational story. Watch TV with the volume very low and with the closed captioning on. While this does not replicate what it is like to watch TV as someone who is hearing impaired, hopefully you will begin to understand the difficulty there can be when watching a TV show when it is hard to hear. The next time you go to the movies, a museum, or other activity, see what accommodations are available for people that are hearing impaired. 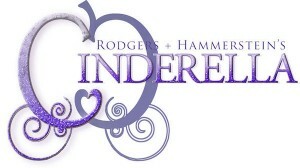 The local "Open Door Theater" in Acton, MA is showing Roger and Hammerstein's Cinderella, with special performances that will be interpreted in ASL. Try to attend an ASL interpreted performance! Open Door Theater is an accessible community theater company that creates learning experiences through theater for adults, children, and people with special needs.